It's hard to believe it's February already. January did go by rather quickly. We're one step closer to Spring! I desperately needed to put together a Valentine's Day tablescape. I was surprised to find that I hadn't shared a tablescape since last Fall! So please join me for "Be Mine." You can see the "whiteness" of January through the window in the photo below. a nice backdrop to the pink & red of my tablescape. Ha! The heart plates & the table runner are from Target. I bought them on clearance a year or two ago. The dotted glasses are a Target purchase, as well. I added a white charger from the Oneida Outlet. in 90 days. I'm going to miss that place! Red silverware was an engagement gift 20+ years ago. Place card holders are a Christmas Tree Shop find. Pink votive holders are from Michaels. I love how the plates & table runner match. 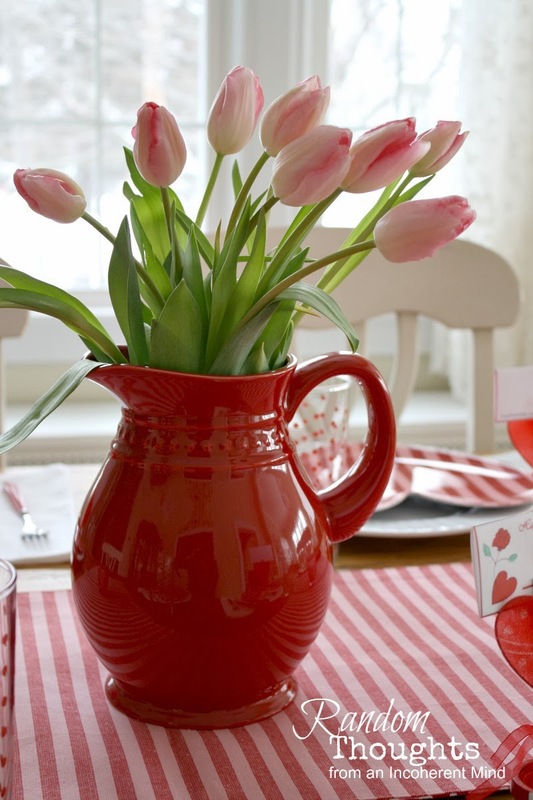 Pretty pink tulips in a red pitcher for a simple centerpiece. It's so nice of you to visit today. I LOVE IT!!! It all flows together so perfectly! You have such great lighting too. Happy February!!!! woohoooo... April is so close. 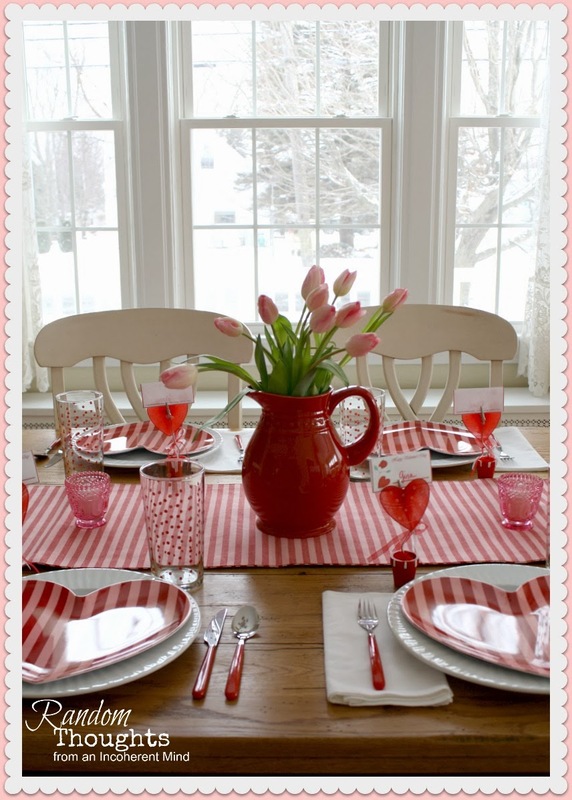 I have missed your tablescapes and I really LOVE love Love that red pitcher with the pink tulips! Perfect Have a great week !! Oh how pretty! I love that red pitcher!! That backdrop is "almost" as perfect as your pretty tablescape! It looks so pretty. I like the red with the white......springy. How have you been? 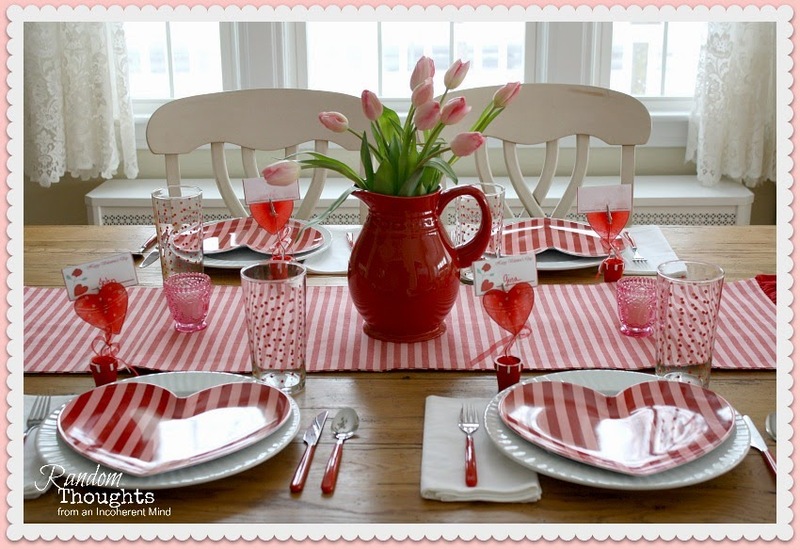 Beautiful tablescape for Valentine's Day! The snow background looks so pretty. 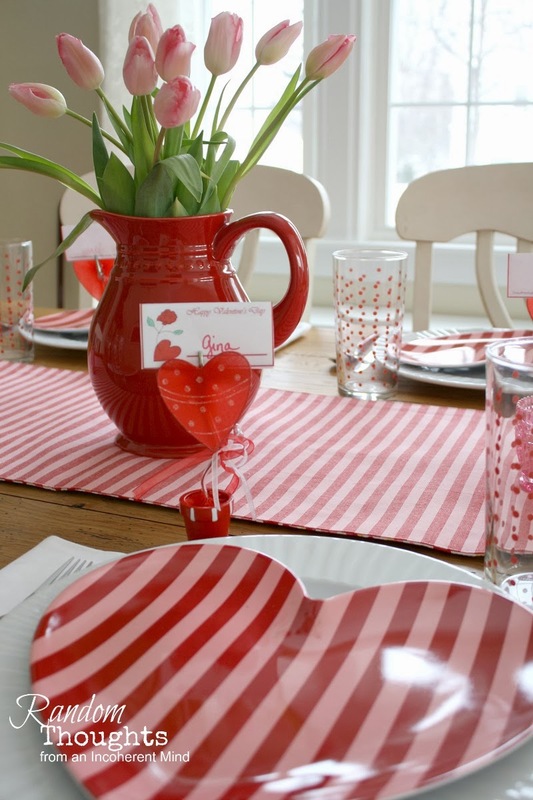 Those heart plates are so adorable and I like how they look on the red and white table runner. I love your table! It's so happy! Of course, I am totally obsessed with red, in general, and tulips! They are my all time favorite flower! 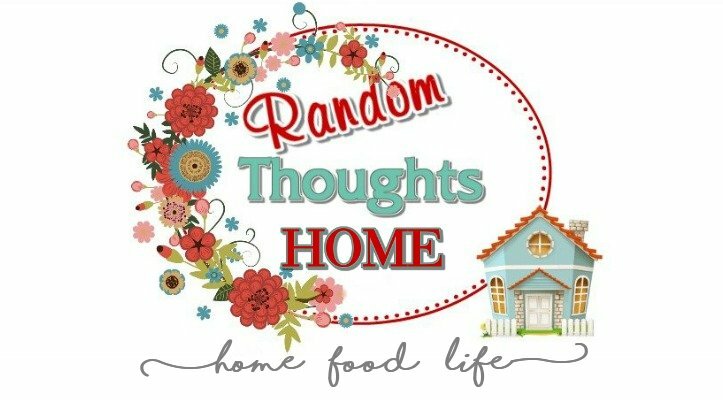 Love it Gina, always love your tablescapes no matter what season it is. 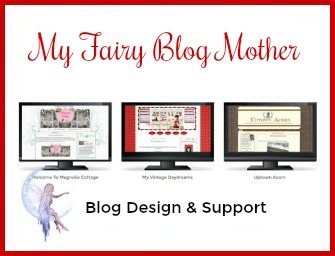 I love the pink and red against the white "snowy" background! It makes the colors pop even more. The heart dishes are darling (Target is awesome, isn't it?!) but my favorite are the tulips. A sure sign of Spring! Looks lovely! We are supposed o get upwards of 8+"
Your table is gorgeous Gina and you're right the snow makes a perfect backdrop. Thanks so much for stopping by. My very favorite thing about this table is the combination of pink with red. That is so pretty to me! I love the tulips in the red pitcher. The backdrop makes the whole thing just perfect. This table is just so pretty and cheerful! The red and pink go so well together and those tulips hint of spring!! What will you be serving up to eat? I need to know. Another gorgeous tablescape! Every detail is beautiful! I love the pink tulips Gina. Your Valentine's table is so sweet!!! 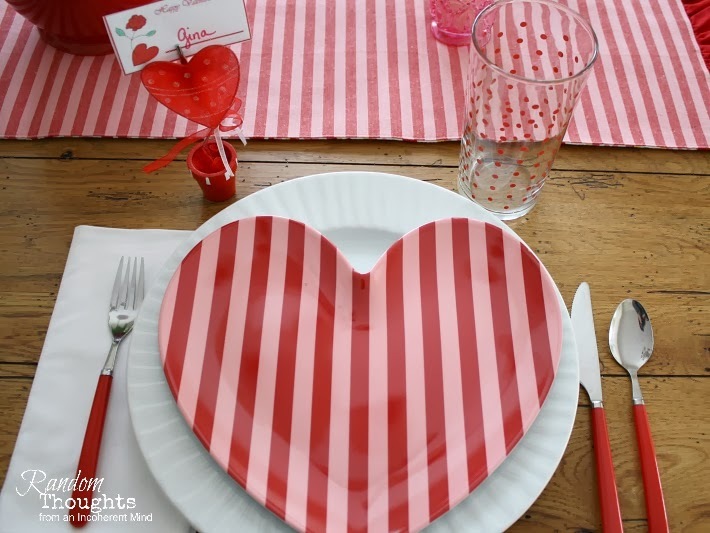 Your tablescape is one of the prettiest Valentine tables I have ever seen. 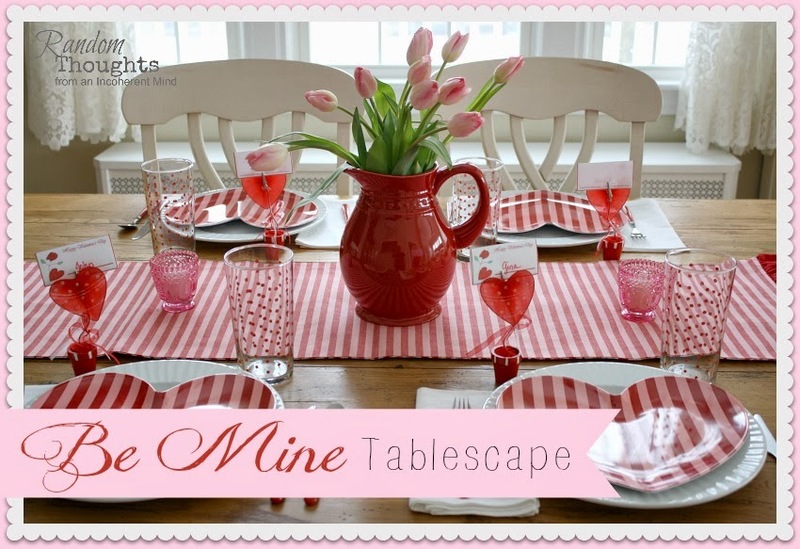 It wouldn't be Valentine's Day without a wonderful tablescape from you! Very sweet Gina and very special. Hey I feel like we are back up North again. Snow in the South! The natural lighting coming in through those windows really makes your table shine beautifully. Love those plates. It is all very pretty, Gina. And the tulips are gorgeous. I got out 2 heart shaped cookie cutters! sad. sad. i'm sorry I haven't been by to visit lately. I love your precious Valentine's Day table. I have the same red pitcher ;-) Hope you are doing well. Have a wonderful weekend!